Children’s theatre is always a winner, and next week there’s the colourfully costumed, singing, dancing show, Psalty: Welcome to the Family. Psalty is an anthropomorphic singing book – the ‘‘P’’ is silent as in psalm – who has appeared onstage in town before, courtesy of Family Friendly Productions. In 2011, a 14-year-old Nina Donkin directed her first show, Psalty and the Take-Your-Time Machine. Nina followed that success in 2012 with a show called A Royal Feast: The Flavour of Christmas, and in 2013, Grandma’s Folk Tales. She took a break from this sequence of shows in 2014, focusing on her singing with the Cantible Trio, and the group produced their own singing variety show at Globe 2 in November last year. 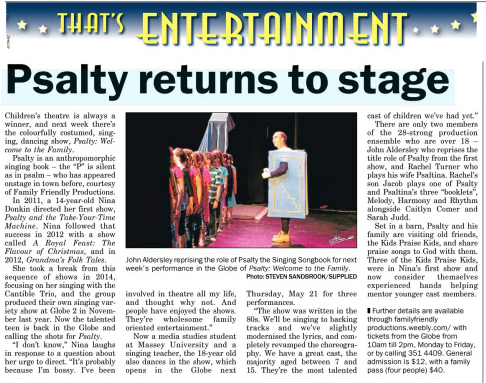 Now the talented teen is back in the Globe and calling the shots for Psalty. ‘‘I don’t know,’’ Nina laughs in response to a question about her urge to direct. ‘‘It’s probably because I’m bossy. I’ve been involved in theatre all my life, and thought why not. And people have enjoyed the shows. They’re wholesome family oriented entertainment.’’ Now a media studies student at Massey University and a singing teacher, the 18-year old also dances in the show, which opens in the Globe next Thursday, May 21 for four performances. ‘‘The show was written in the 80s. We’ll be singing to backing tracks and we’ve slightly modernised the lyrics, and completely revamped the choreography. We have a great cast, the majority aged between 7 and 15. They’re the most talented cast of children we’ve had yet.’’ There are only two members of the 28-strong production ensemble who are over 18 – John Aldersley who reprises the title role of Psalty from the first show, and Rachel Turner who plays his wife Psaltina. Rachel’s son Jacob plays one of Psalty and Psaltina’s three ‘‘booklets’’, Melody, Harmony and Rhythm alongside Caitlyn Comer and Sarah Judd. Set in a barn, Psalty and his family are visiting old friends, the Kids Praise Kids, and share praise songs to God with them. Three of the Kids Praise Kids, were in Nina’s first show and now consider themselves experienced hands helping mentor younger cast members. ❚ Further details are available through familyfriendly productions.weebly.com/ with tickets from the Globe from 10am till 2pm, Monday to Friday, or by calling 351 4409. General admission is $12, with a family pass (four people) $40.